Aren't these the sweetest Pansies? 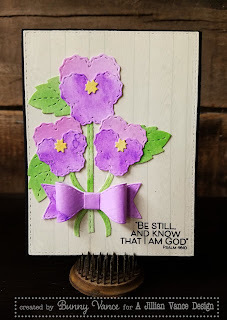 I love the new Pansy Die Set by A Jillian Vance Design! It features 3 different sizes of blooms to be layered! Doesn't it look great with that Mini Bow? Some cards you finish and just LOVE and this is one of them! And my favorite bible verse just completes this card! Check out the A Jillian Vance Design Blog HERE for more details!